We do more than weddings! The PhotoBooth is also popular at corporate functions and non-profit events! In February we were at the American Advertising Awards with American Advertising Federation - Madison at the Monona Terrace Community and Convention Center. Group shots were easy with our Modern PhotoBooth! In January we traveled to Milwaukee for Marquette’s School of Dentistry Winter Gala! This event was held at fun and interacting Discovery World venue in downtown Milwaukee. The Classic PhotoBooth was a blast as always and there was a line all night! While we love weddings, we also love other types of events! 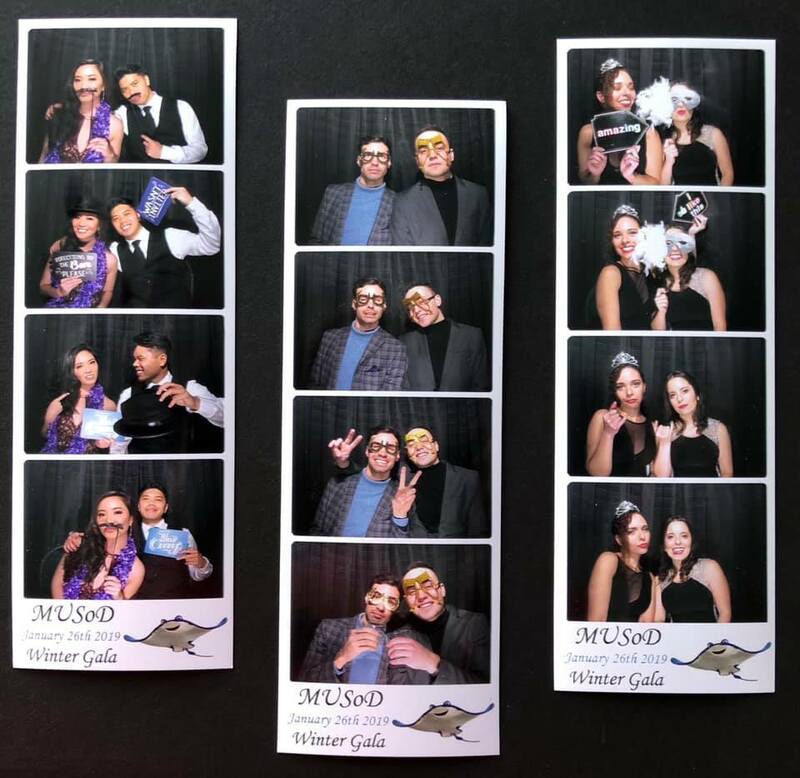 The PhotoBooth makes frequent appearances at black tie events, school functions, graduation parties, holiday events, and more! Milwaukee, Madison, and now Green Bay! January 18th & 19th we completed our three weekend wedding show streak with The Wedding Show - Winter Edition at Shopko Hall in Green Bay! This wedding show is always held on a Friday & Saturday in case The Green Bay Packers have a playoff game on Sunday. Friday & Saturday was a change up from our previous two wedding show weekends, but let me assure you it was just as busy! 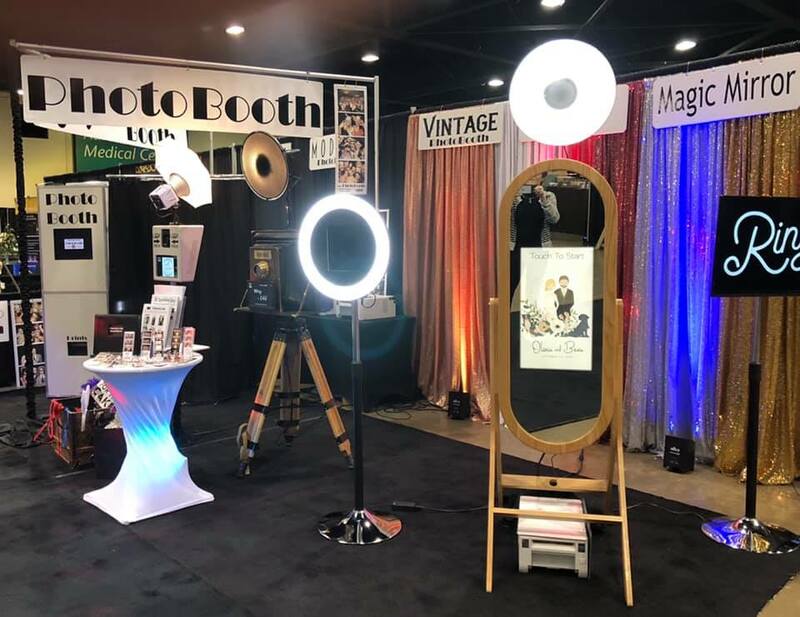 The PhotoBooth was in Madison January 12th & 13th at the Wedding Planner & Guide Winter Wedding Show at the Alliant Energy Center. We understand that not every wedding or event is the same and your photobooth should reflect your style! We brought all SIX of our unique PhotoBooths to the event! It was fun weekend in Madison! We had a great time meeting hundreds of engaged couples January 5th & 6th at the Wonderful World of Weddings Show at the Wisconsin State Fair Park! We brought all SIX of our PhotoBooths to the event. 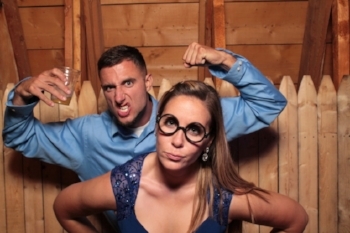 People were able to dress up, strike a pose, and try out our PhotoBooths in person to find the booth perfect for their upcoming wedding celebration. It was a blast! New Years Eve Wedding to bring in 2019! We were honored to be a part of Matt and Chelsea’s New Years Eve Wedding Reception at the Pfister Hotel - Imperial Ballroom to ring in 2019! The Modern PhotoBooth was taking pictures non stop all night long! Matt & Chelsea chose our “gold” backdrop for their night and we worked with them to make a customized monogram for their photostrips! The home of the Packers, Lambeau Field was the one of a kind Wedding Reception for Joe and Elizabeth in July! The Modern PhotoBooth with our “gold” backdrop was a hit at this reception. A lot of great group shots. We uniquely designed a monogram just for the couple that featured Lambeau Field! A wonderful September wedding for Kim and Zach at the Seven Seas in Hartland! We brought out the Modern PhotoBooth for this nautical themed wedding at the Seven Seas and created a customized nautical themed monogram for their event! We met with lots of folks on Tuesday evening, September 19th at the Wedding Trends Unveiled show hosted by the Madison Club just down the street from the Capital. The staircase there was a great backdrop for the Vintage Photobooth! The Wedding dress display by Vera's served as a fantastic backdrop for our Modern PhotoBooth, and there was a contest to see how many people could fit in the Classic PhotoBooth at one time! It was a wonderful evening! Bucky Gets Into the Action! Bucky was part of an awesome wedding in Madison with the Vintage PhotoBooth at Union South. We created a customized monogram for Abby and Michael that they used on their photostrips. We also projected the monogram at their reception. Go Badgers! The Vintage Photoboth was out a few weekends ago at The University Club in Madison for an awesome 20's themed Great Gatsby wedding! We met with lots of enthusiastic brides and grooms at the Wonderful World of Weddings show at State Fair Park. We look forward to visiting with you at the upcoming Wedding Shows in Madison, Milwaukee and Green Bay! We like backdrops, all kinds! From shimmery gold and silver to Vintage print to using what’s available at each venue. Sometimes those are the best! It’s no secret we enjoy wine and a great party! Put that together with a wonderful venue and magic happens! 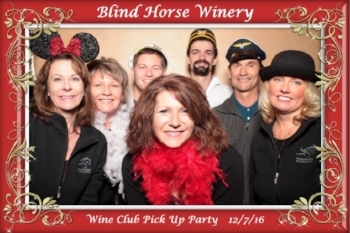 We were recently thrilled to be a part of a Wine Club Member Party at the Blind Horse Winery in Kohler, Wisconsin. Not only is it a great venue, but it’s one of Wisconsin’s hidden gems, a wonderful winery, fantastic restaurant and unique event venue! The wines they craft our best we’ve tasted this side of Napa Valley!